Hey everyone! I have been busy playing with my Lawn Fawn stash, and had to play with the Booyah stamp set...yet again! So stinkin cute! I attempted to make my first spinner card, though I really had no idea what I was doing, lol. Next time, I will make the string tighter somehow, but I still think it turned out cute,,,and each of the characters spin. My kiddos got a big kick out of it! The only tricky part was making a mirror image of the ghost, so his body and hat would be facing the right way for his back. I loved how this turned out, it was so fun to try something new. 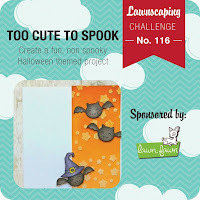 Also I used the wave border dies to create the scallop border, kind of a spooky scallop border. I am entering this in the Lawnscaping Challenge, you should come play along too! This came out fantastic!! I LOVE those little ghosts!! What an awesome and fun creation! My current blog challenge is - I Ain't Afraid of No Ghost! ~ Join me!